After making Crock Pot Apple Butter from the apples I picked up at the farmer’s market , having a lot leftover, and picking up more apples this past weekend (Facebook update), I have apples galore in my house! 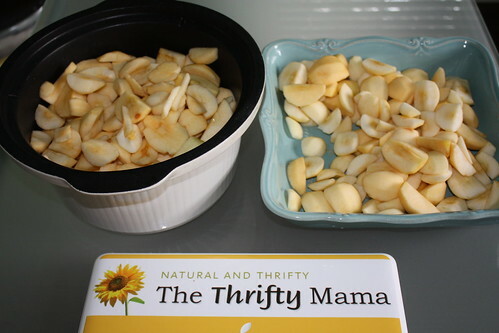 I want to save the apples for baking this fall and winter, so I’m peeling, coring, cutting and freezing them. By the way, here’s a great cast iron apple peeler that I recommend if you are looking to save time on peeling apples and potatoes. 2. Fill a bowl with water and add about one-two tablespoons of salt for every gallon of water. Let dissolve. 2. 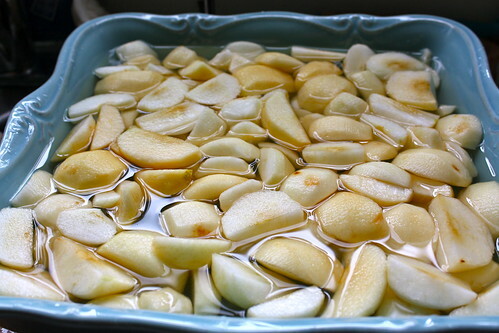 Add in the apple slices and submerge to let soak for just a few minutes. 3. Pour the apples and water through a strainer and drain. 4. Place in freezer bags (or foodsaver for those of you that have one), and make sure to spread them out so that they are less likely to stick together during freezing. 5. Place in your freezer. Lasts six months or a year if placed in a deep freezer. Now you will have apple slices at a moments notice for your pies and and other scrumptious goodies this fall and winter! And you can make some apple and oats breakfast pudding on the fly! And be sure to also check out all of my other Apple Recipes. I never saw your recipe for oatmeal-apple pudding. I would love to try it! I was just wondering how to freeze apples! thanks for the tip! You can freeze other fruits the same way, such as peaches, pears, strawberries, and all berries. If you blanch some vegetables, peas, green beans, corn, you can freeze them too. I spread mine on a cookie sheet and freeze, then bag them in quart size freezer bags. 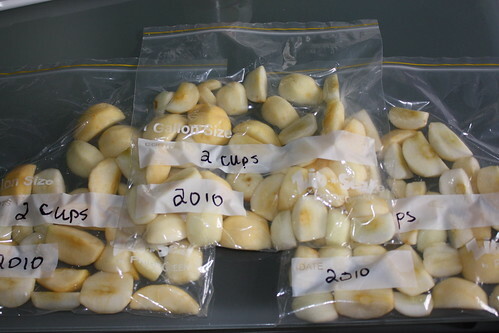 Blanching is submerging items for about one minute in boiling water. It helps take the skins off peaches and it also stops the ripening process. Enjoy!